Academy Award nominee Will Smith (2006, Best Performance by an Actor in a Leading Role, The Pursuit of Happyness) stars as Ben Thomas, a man at a crossroads searching for a way to redeem his heavy conscience. He discovers he has the power to change the circumstances of seven strangers who deserve a second chance. But when one of them captures his heart, he must decide if he should reveal his secret - even if it means giving up on his plan. 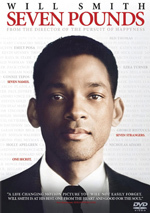 From the creators of The Pursuit of Happyness, Seven Pounds is an "emotionally charged, captivating mystery with a soulful, tender love story and a tearful but joyfully inspiring ending" (Movieguide). $14.851 million on 2758 screens. Answer: 2001’s Ali. Question: what was the last Will Smith movie that failed to make at least $100 million? Until 2008’s Seven Pounds, that is. 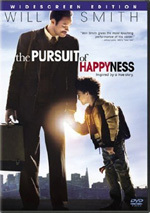 Although this flick reunited Smith with director Gabriele Muccino, his collaborator on 2006’s hit The Pursuit of Happyness, Pounds failed to find much of an audience. It stalled at $69 million, a rather tepid take for a Smith movie. In Pounds, Smith plays Ben Thomas, an IRS agent. In the wake of tragedy, Ben tries to reward good in the world, a quest that leads him to intersect with a mix of strangers who require various forms of help. Yes, that may be the shortest story summary I’ve ever committed to a review. The nature of Pounds means that less is more in this circumstance; if I provide greater detail, I risk spoiling different elements and I also may dumb down the tale too much. Often when I wrote plot synopses, I just transcribe events as they happen during the movie. Sometimes it becomes more complex than that, and Pounds clearly turns into one of those cases. It takes the viewer a good half an hour to get any grasp of where the story will go, though the alert audience member will figure out probable plot paths not long after that. Like I said, I don’t want to spill too many beans, but once the film sets up its groundwork, it becomes pretty clear where some elements will go. This means the movie loses some appeal once it lands on firmer ground. The first act works well largely because it keeps us off-guard. We want to figure out what’s happening, so we’re intrigued by the tidbits Pounds reveals to us. The tale doesn’t tank once we become more secure in our understanding of where it will go, but it does lose a little steam. But just a little. There’s more than enough character drama generated as the flick progresses to ensure that we remain with it. Do some of these bits get predictable? Sure, but the movie still throws us some real curveballs. Smith provides a typically excellent turn as Ben. For reasons I don’t understand, a lot of moviegoers like to stereotype Smith as nothing more than a cocky action hero. True, Smith plays those parts well, but he possesses much greater range than that, and we see this via his multidimensional work in Pounds. The film forces Ben into a variety of moods and situations, all of which Smith pulls off with aplomb. Now that I’ve seen Pounds, I think I know why it didn’t find a bigger audience at the multiplex. The ad campaign offered almost no clue what the movie was about, but one shouldn’t blame the marketing folks for that; it’s an exceptionally difficult film to sum up in two minutes or less. Smith’s name was enough to get it to $69 million, and that should be seen as a sign of his audience appeal. If a flick without no clear sales hook can get to that figure, I guess a film in which Smith scratches himself for two hours would make about $69 million. Pounds is significantly more interesting than Will Scratches an Itch, though. 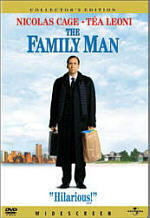 The movie unfolds in a slow manner that may seem maddening to some, but I think it allows the flick to keep us involved. Add to that strong acting and this becomes a pretty solid effort. Seven Pounds appears in an aspect ratio of approximately 2.40:1 on this single-sided, double-layered DVD; the image has been enhanced for 16X9 televisions. Only a smattering of fairly minor issues affected the transfer. In terms of colors, Pounds tended to stay with a natural palette. Hues took on a light golden tone at times, but that stylistic choice didn’t overwhelm. Instead, the colors appeared pretty clear and concise. Blacks were deep and firm, while shadows showed good delineation. Overall, this was a pleasing presentation. I also felt the Dolby Digital 5.1 soundtrack of Seven Pounds worked fine. Ambience opened things up to a decent degree. Music demonstrated good stereo delineation, and the effects showed solid localization. This was never a particularly engrossing soundfield, but it created an acceptable sense of place. Audio quality was always good. Speech sounded crisp and distinctive, and music followed suit. The score was consistently lively and full. Effects also demonstrated nice vivacity and accuracy, with decent bass response along the way. I expected a fairly low-key track and that’s what I got. A smattering of extras finishes off the disc. We open with an audio commentary from director Gabriele Muccino. He provides a running, screen-specific look at cast and performances, characters, story and themes, editing, cinematography and visual choices, some effects, and a few other production topics. While I enjoyed Muccino’s chat for Pursuit of Happyness, this commentary seems less inviting. On the positive side, the director does offer a reasonable number of production insights, especially when he deals with the unique challenges prompted by the story. However, Muccino often just explains the movie, and dead air becomes a concern. All of these conspire to make this a pretty mediocre track. Four featurettes follow. Seven Views on Seven Pounds goes for 31 minutes, 35 seconds and presents remarks from Muccino, screenwriter Grant Nieporte, producers James Lassiter, Steve Tisch, Jason Blumenthal and Todd Black, location manager Kei Rowan-Young, production designer J. Michael Riva, editor Hughes Winborne, composer Angelo Milli, and actors Will Smith, Michael Ealy, Barry Pepper, Rosario Dawson, and Woody Harrelson. The program covers character and story issues, what various members of the crew brought to the production, sets, locations, and production design, and music. As implied by its title, “Views” splits into seven shorter pieces, each of which emphasizes a different perspective on the film. This makes it a little disjointed, and some topics receive better exploration than others. Nonetheless, “Views” manages to cover a lot of ground and it does so in a satisfying manner. Next comes the 12-minute and 56-second Creating the Perfect Ensemble. It features Muccino, Smith, Dawson, Nieporte, Pepper, Ealy, Harrelson, and casting director Denise Chaiman. This one looks at the supporting cast and their performances. It comes with more fluffy praise than “Views”, but it still includes a reasonable amount of good information. We get a little wildlife lesson via The Box Jellyfish: The World’s Deadliest Co-Star. This four-minute and 58-second show features Cabrillo Marine Aquarium director Mike Schaadt. He gives us facts about the box jellyfish, all of which make me really happy I never learned to swim. For the final featurette, we find the eight-minute and 44-second Emily’s Passion: The Art of the Printing Press. It provides notes from International Printing Museum director/curator Mark Barbour as he shows us various old presses. We get a nice look at how these machines work in this interesting piece. Four Deleted Scenes fill a total of four minutes, 14 seconds. These include “Ben Leaves Message for Dan” (0:35), “Dr. Gatsinaris Confronts Ben” (2:30), “Ben Gets Duke” (0:42) and “Ben Watches Ezra at the Mall #2” (0:27). All feel pretty insubstantial. A couple thicken the plot, but the story’s already thick enough, so they seem unnecessary. “Duke” and “Ezra” are brief filler moments that add nothing. The DVD opens with a few ads. We get promos for Blu-Ray Disc, Angels and Demons, I’ve Loved You So Long, and Not Easily Broken. These also appear in the Previews area along with clips for The Accidental Husband, Rent: Filmed Live on Broadway, Hancock and The Pursuit of Happyness. No trailer for Pounds appears here. If you want a tight, easy-to-follow narrative, Seven Pounds isn’t for you. If you want an intriguing drama with interesting twists and excellent acting, though, I think you’ll get something from it. The DVD comes with good picture and audio as well as a mix of interesting supplements. I recommend this emotional character piece.